“Mom, Dad, Grandma, Grandpa, Teenager, Uber or Pizza delivery driver… No matter how old you are, or what you do — if Mark Zuckerberg loves his Honda Fit, then so can you”. Disclaimer: I’m the happy owner of a 2012 Honda Civic with little over 50,000 miles on the odometer, so I really looked forward to driving the new Fit. Honda’s spunky little hatch makes me think of the term “One size fits all” for multiple reasons, but more importantly because as a Dad, having a safe and reliable, yet good-looking and fun to drive car is very important. However, I’m left wondering, does the Honda Fit manage to stand out, in a rather crowded segment? Find out! The Honda Fit, or Jazz (as its known in the rest of the world), first sold in the U.S back in 2006 — a whole five years after its debut in Japan. Fast forward to 2014, and nearly five-million Honda Fits have been sold worldwide, so chances are if you in Mexico or overseas, you are used to seeing tons of them, and for a very good reason. Statistically the Fit customer base is largely made up folks mainly focused on convenience and fuel efficiency, rather cutting edge technology, or even good looks. But it seems a light bulb went off at the Honda design department, and they’ve managed to improve on the already great formula that made the Fit so successful across the globe. The result? Think of an Apple engineer and a supermodel having a baby. A futuristic and “high-tech” looking front end, along with a sporty rear bumper with fake-but-cool air outlets give the Fit a bit of a “Hotwheels” look. Sculpted headlights, taillights and surprisingly attractive black and silver 16-inch wheels pump up the Fit’s character and attitude. As you may expect, all those cool bits and pieces that make the Fit unique are crafted in typical Honda quality, and don’t look cheesy or cartoonish as in other vehicles in this segment. The Fit manages to turn a few heads while driving down the road, but most importantly, it made a couple of my previous generation Fit-owning neighbors walk over to my house to take a closer look. I’m not keeping up with the Joneses, I am the Joneses (even if it’s just for a week). If you’ve ever watched or read any of mine or others reviews on a hatchback, then it won’t surprise you to hear me say “it’s bigger than it looks”, as most 5-doors can be described that way. But the Fit goes above and beyond just “feeling bigger” by utilizing every square inch of its tiny real estate in very clever ways. Take for example the driver’s left side cupholder, not only is it ergonomically perfect, but since it’s located by the AC vent it’ll even keep your drink cool (or warm)! But the Fit’s secret weapon is its magical back seat. The 60/40 split rear bench seat folds down to accommodate larger items (like dollhouses), and the seat bases will even flip up and lock into place to open up a massive and perfectly flat space. The Fit surely is no pick up truck, but once your friends find out about the Fit’s cargo capabilities, you’ll be their best moving buddy. On the road the Fit feels empowered and will happily accelerate, brake, and turn on demand. It isn’t until you really step on the throttle that the Fit steps out from its comfort zone, not because it can’t or doesn’t want to go, but because the 130-hp, inline-4 starts making a rather loud and somewhat obnoxious sound, as if it were trying to tell you to relax and take it easy. Although I found a solution to that problem — use the paddle shifters. If you feel extra energetic on your way to work, put that smooth CVT transmission to work, and shift down to “S” for sport mode and paddle away! The Fit becomes extra lively, and you’ll be guaranteed a zippy and nimble drive. Honda rates the Fit with the CVT automatic transmission at 35-MPG combined, which is only three miles per gallon more than our personal average of 32-MPG combined over a 290-mile distance. Honda is known for building safe and reliable vehicles, and the 2015 Honda Fit isn’t the exception. Inside, our Fit was equipped with the standard multi-angle rearview camera and Bluetooth Handsfree Link, as well as with the EX-L trim goodies like smart-entry/push-button start, Siri Connectivity, and Honda’s unique LaneWatch blindspot monitoring system, which uses the center screen as a monitor to display any vehicles or objects hidden in your passenger side blind spot. Speaking of Honda’s truly innovative LaneWatch system, it works flawlessly, and even took some time getting used to not having it once our test car was gone, but Missi and I can’t understand why there isn’t any sort of blindspot monitoring system on the driver’s side mirror. It just seems weird that after designing such an incredible system, it would only be fitted to one side of the car, and not both. There are blind spots on the driver’s side too — you know? 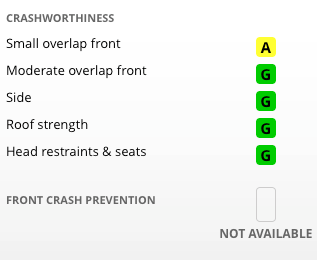 While the driver-aids work overtime to keep us safe on the road, sometimes accidents are unavoidable, thankfully the Fit is equipped with dual threshold front airbags, and side curtain airbags with rollover sensors that cover the first and second row. 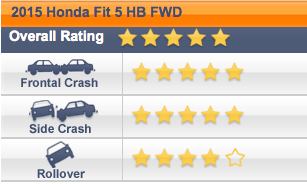 And if there weren’t enough, the Honda Fit is a IIHS Top Safety Pick! We spent a total of seven days with our Fit, and more than just enjoying it, we actually looked forward to jumping behind the wheel. Whether it was grocery shopping, taking the kids to the park, or just simply discovering all its nifty features, we feel that the Honda Fit is definitely the perfect fit for most budget and size conscious families. Small enough to be practical, big enough to be convenient. Lack of blind-spot monitoring on the driver’s side. No AC vents or power outlet for second row occupants.